at Ljubljana’s Faculty of Architecture. 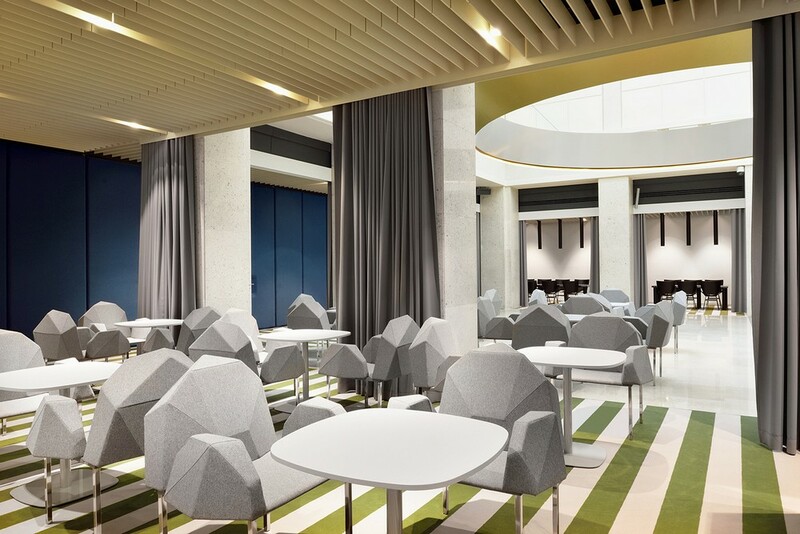 The project was executed by SADAR+VUGA in close collaboration with the initial student design team. Bank of Slovenia’s headquarters are located on Slovenska Boulevard in Ljubljana. The portal of the 1920s building is adorned by two mighty Atlants. Behind this impressive entrance is the central lobby of the Bank of Slovenia. Before the reconstruction it had the character of a publicly accessible, monofunctional bank hall: it hosted cashier desks and a mailroom. Despite its central location and formidable size, it was in no condition to host protocolar events. 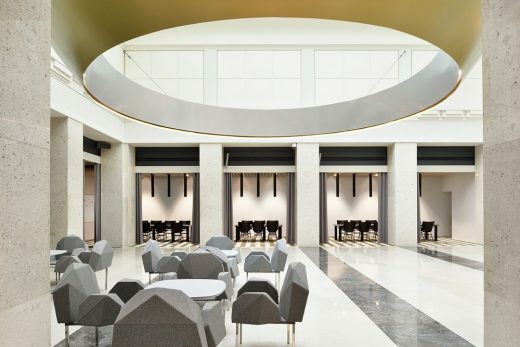 A complex programmatic and spatial reconstruction made the lobby an interactive space, intended mainly for the Bank’s employees. The space is designed to provide a more relaxed, diverse and interactive work environment and at the same time create a protocolar space for Bank’s official events. Combining the two created a space which offers strong identification for the employees as well as for the institution. The monofunctional space became a frame within which several ambients and programs were layered. The new programmatic sections, incorporated in the niches, intertwine in a club-like ambient without strict programmatic boundaries. A soft curtain, that allows the users to regulate the level of intimacy, is the only physical boundary of the space. Library is placed next to the south openings; adjacent to it is a small self-service bar. Both are separated from the main area by a glass wall. 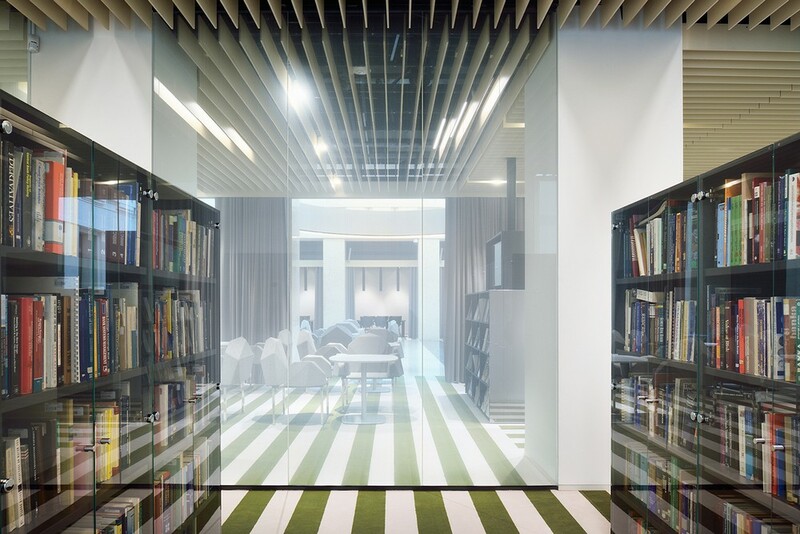 Library’s program is complemented by the reading room, and café extends into a lounge area. 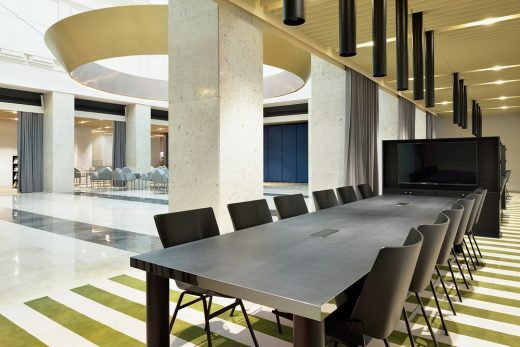 Three meeting rooms are placed on the opposite side of the lobby. 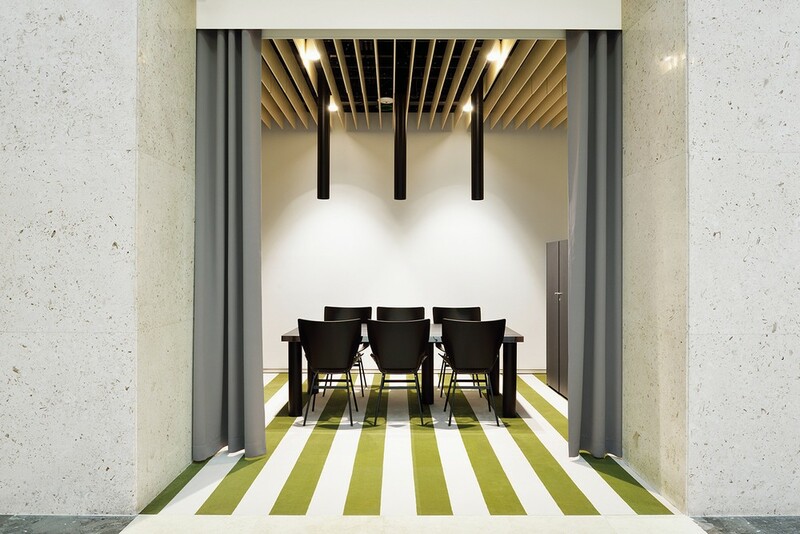 Closing the curtain separates them from the main space and thus ensures privacy for informal meetings and workshops. Service spaces are placed at the back of the lobby, their walls upholstered with rich blue textile that gives depth to the space. 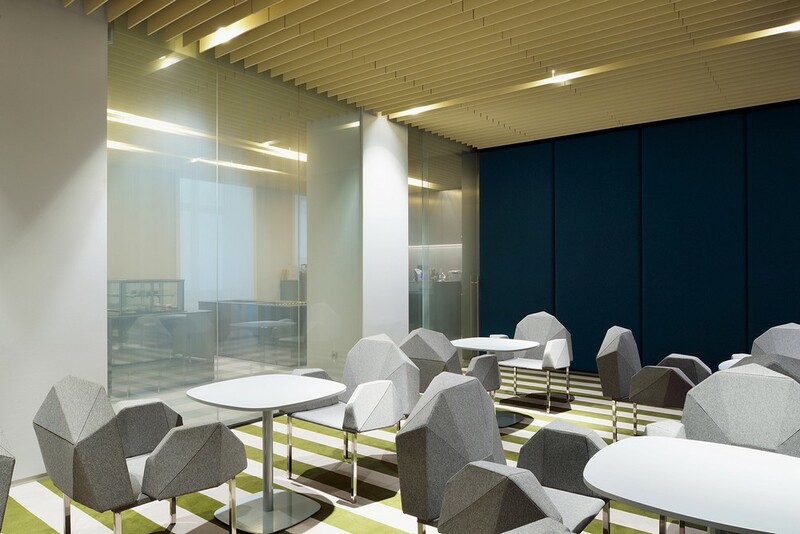 The lobby is furnished with a comfortable armchair Triglav, developed for this project. 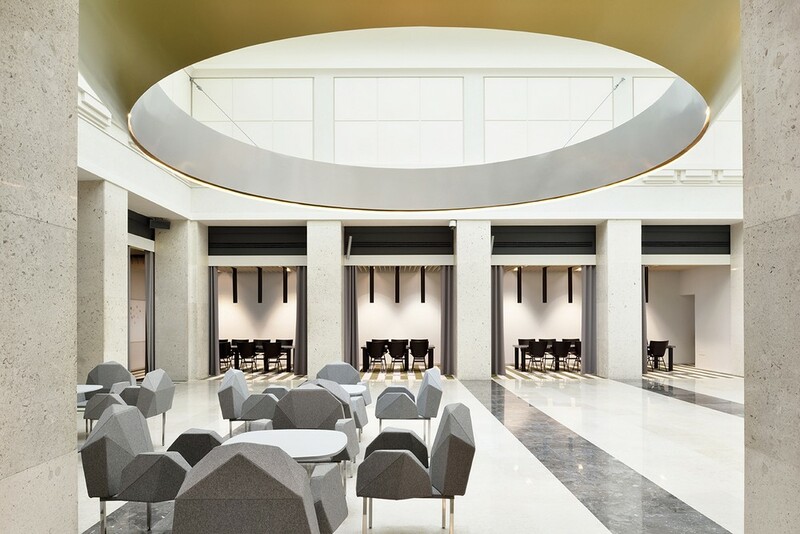 The new areas intentionally recreate a living room-like environment, where the employees can feel comfortalbe and at ease. Warm and soft materials, like textile (curtains, flooring, upholstery) and wood (celiling lamellas), are chosen. The area is ambientally lit. Blue, green and golden tones are complemented by neutral furniture in dark matte and reflective tones. The central, triple height area, is in contrast with the warm and ambiental surroundings. Its classical architecture is accentuated with stone cladding and a monochromatic palette, which makes it a perfect setting for protocolar events. 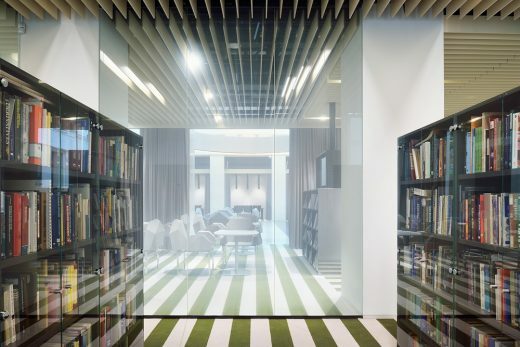 The central space can be separated from other programes by enclosing the curtains around its perimeter. 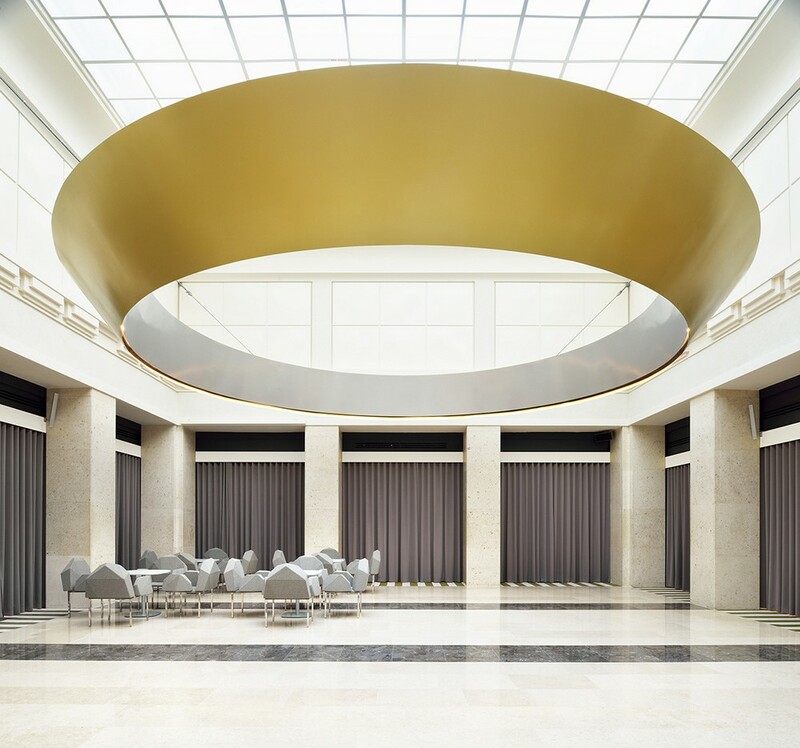 The lobby’s main feature is a mighty chandelier, which – with its circular form and silver and gold materiality – simbolizes a coin as a representative image of the national bank. The ‘levitating coin’ is made of a metal truss, lined with satinated tin in two shades, suspended from steel cables and mounted into the walls. 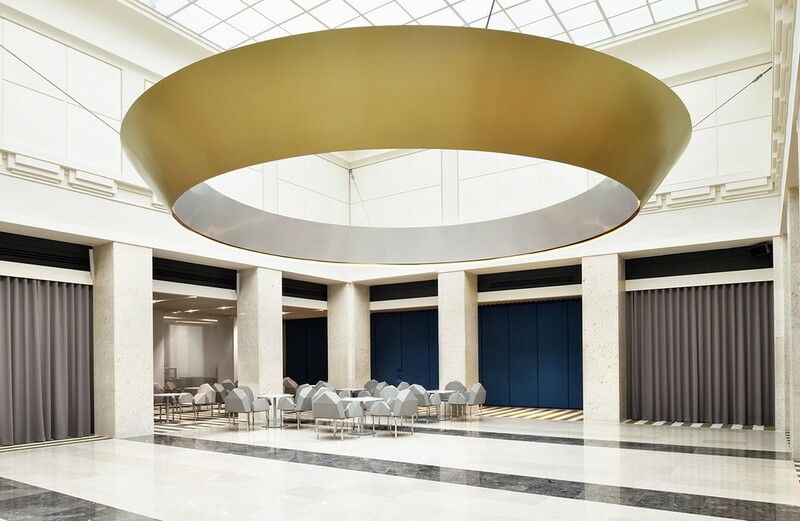 The chandelier centers the programmatically mixed lobby and creates a solemn atmosphere appropriate for the events it holds.